A Somali-American teenager arrested Friday on suspicion of plotting to bomb a holiday ceremony in Portland, Oregon, told an undercover FBI employee that he wrote articles published in an English-language jihadist magazine, including a story on fitness, an FBI affidavit says. Mohamed Osman Mohamud, 19, told the undercover operative last summer that he had written articles for the online magazine Jihad Recollections under a pen name, according to an FBI affidavit filed with Mohamud's arrest warrant. One of the articles Mohamud claimed to have written was "Getting in shape without weights," which was published in the inaugural issue of Jihad Recollections in April 2009, according to the affidavit. In the article, the author - identified as Ibn al-Mubarak - writes that jihadists must prepare their bodies for war and "train as hard as possible in order to damage the enemies of Allah as much as possible." The article implores readers to train without weights, in part because using them is "unrealistic for the Mujahid in the front lines anywhere in the world today," and because gyms are not Islamic environments, with their "music, semi-naked women [and] free mixing." The piece describes stretches and warm-ups before instructing on ways to sculpt one’s legs (suggestions include walking at least 90 minutes a day, doing interval runs, crawling long distances and sitting against a wall for long periods) and strengthen one’s arms (100 to 150 push-ups per day, pull-ups, walking on hands). "We find that [weights are] ... a major setback for the Americans and the NATO Crusading army as they cannot go to any battlefront without carrying along with them their bench, squat sets and sometimes even their machines," the article says. 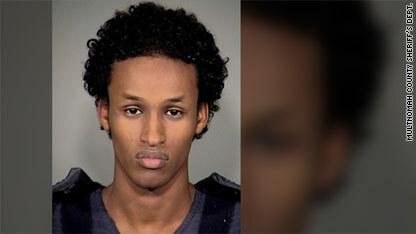 U.S. authorities say Mohamud was arrested in connection with a plan to detonate what he believed to be a vehicle bomb at Portland's Christmas tree lighting on Friday night. He attempted to detonate the device, which was a fake planted by authorities in an undercover operation designed to undermine him, the Justice Department said. A resident of Corvallis, Oregon, and a student at Oregon State University, Mohamud was arrested on suspicion of attempting to use a weapon of mass destruction, the FBI said. He will make his initial appearance Monday in federal court in Portland, the Justice Department said. The arrest was the culmination of a long-term undercover operation during which Mohamud, a naturalized U.S. citizen from Somalia, was monitored closely as the alleged plot developed, the Justice Department said. Mohamud made the article claim to an operative involved in that undercover operation, according to the affidavit. Mohamud said he wrote two other articles for Jihad Recollections, and that he also sent an article to another jihadist publication, Inspire, according to the affidavit. The court document does not identify those articles. U.S. counterterrorism officials have said Jihad Recollections was produced by former North Carolina resident Samir Khan, who those officials now say they believe is living in Yemen. Intelligence officials also suspect Khan is the driving force behind Inspire. everyone has lots of opinions about what has happened, should happen, what is right and what is wrong. The real question is... what are you going to do about it? The guy who tipped off the FBI about this guy did something. If everyone cared and stood up for themselves and others, and talked to other people, even strangers about things they see then there would be less chance for people like this guy to slip through the cracks. There is no terrorism in Islam. 'Islamic terrorism' is an oxymoron. U.S. out of Afghanistan now!!!!! you got it all wrong. Muslims are not worshiping a profit of god, but my dog.. muhammed. God be praised that Muhammed is in good health and presently striking down the infidel's; darn cats! "1 in 4 (26%) U.S. Young Muslims OK with Homicide Bombings Against Civilians." Come on people...what do you expect from this cult ideology called Islam?!?! And that is just for Muslims living HERE in this country...not some Islamic arm pit like the Middle East! Think about it...Mohamed Osman Mohamud is just your typical jihadist following Islam as his terrorist prophet intended. He is simply being a "good" Muslim, nothing less! I cant believe you people are ripping on phil so bad... GO PHIL!! too bad most of the country is as ignorant as most of the people on here. So many haters on here too... You haters are just as bad as the jihadists !